Atlanta Opera Chorus Master Walter Huff has been named a full-time associate professor of choral conducting at Indiana University, but will also remain with the opera — for his 25th season. The Atlanta Opera today named Israeli stage director Tomer Zvulun its new general manager and artistic director, effective June. 1. Zvulun succeeds general manager Dennis Hanthorn, who left rather abruptly last July. If you’re a composer, lyricist, singer, stage director or stage manager — with a yen for opera, Atlanta Opera wants you. 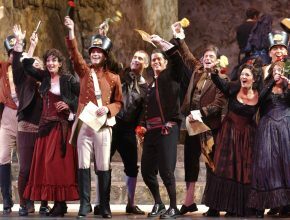 The Atlanta Opera has experienced more change in the past 10 years than at any other time in its its 33-year existence. Here’s a look back — and ahead. Atlanta Opera is taking the children’s opera “Stone Soup” to Woodstock, Decatur and two intown venues. Atlanta Opera Chorus Master Walter Huff will join the Indiana University Jacobs School of Music faculty this fall as an adjunct associate professor of music in choral conducting.